When thinking about college, what comes to mind? Perhaps stereotypical images or misconceptions of college life, a friend or sibling’s story, or scenes from popular movies? In popular culture, some movies depict college life as a party atmosphere in which students binge drink and waste their parents’ money to have a good time without consequence. Films including National Lampoon’s Animal House and Van Wilder as well as Accepted, to name a few, portray the student experience as a blatant disregard for education coupled with excessive drunken buffoonery. However, my party experience illustrates a side to college that is not generally in the limelight. During my first weeks in college, I felt disconnected from the campus and feared that I would not make friends or find my niche. I was commuting from my family’s home and wanted to do more on campus than just go to and from class. I was enrolled in a First-Year Experience (FYE) course that was intended to provide a framework for a successful undergraduate career and beyond. In the class, we learned about student support services on campus (tutoring, personal wellness, academic advisement, etc.) as well as personal success skills (time and financial management, values exploration, etc.). Being a new student, and a commuter, I was overwhelmed by the amount of new information, new territory, campus culture, and unfamiliar processes. I asked my FYE instructor after class one day if there was something I could do to feel more connected to campus. She opened my eyes to a side of college that I was missing—this was my invitation to the party. My FYE instructor promptly led me to her office, introduced me to the staff, and explained the variety of involvement opportunities available through her office. I was amazed that there was so much to do on campus! Because of that meeting, I decided to apply for a job in the Student Union working at the information desk. This position was a catalyst for all of the additional parties I would be invited to throughout my time as an undergraduate student. With so many possibilities, I had to be diligent in prioritizing my time and energy. Friends knew me to be much like the girl in the meme above. I was juggling extracurricular activities and two jobs all while maintaining a full course load. I had to be proactive and diligent to coordinate activities and assignments and make sure I had the time to do it all. Finding a system was a trial and error process, but ultimately I found a method that worked for me. I was an undergraduate student when apps didn’t exist and Facebook was just becoming popular, so my organizational system included a planner, a pen, and a lot of highlighters. Whatever that organizational system looks like for you does not matter as long as you use it. It may be difficult to discuss your studies and educational experience with a parent or someone that has a significant interest in your academic achievement. This was the case for me; I was the first kid in my house to enroll in college, and my parents were under the impression that grades would be sent home like they were in high school. During the New Student Orientation program, my Mom learned about FERPA (Federal Educational Rights and Privacy Act) and what that meant for my grades. “FERPA gives parents certain rights with respect to their children’s education records. These rights transfer to the student when he or she reaches the age of 18 or attends a school beyond the high school level.” In essence, parents cannot access grades or other restricted academic information unless you provide it to them (http://www2.ed.gov/policy/gen/guid/fpco/ferpa/index.html?src=ft). I was fortunate enough to have my parents’ financial support toward tuition, so they felt entitled to reviewing my grades at the end of each semester. I did not want to give them direct access to my grade report by filing a FERPA waiver, so after much deliberation, I agreed to share my grades once released at the semester’s end. If their standards were not met, there would have to be a conversation about repercussions. In the fall of my sophomore year I took my first online course—Introduction to Computers and Statistics. All of the lectures and assignments were available online at anytime and exams were administered in a computer lab on campus. I thought having the ability to view lectures on my own time would be more conducive to my schedule as I was becoming more involved on campus. For the first few weeks of classes I watched the lectures regularly and did the assignments on time. Slowly but surely I found myself prioritizing my time differently, ultimately putting my online class on the back burner, because (I told myself) the work could be done anytime! By the end of the semester I realized that I was going to fail the class. No amount of extra credit, crying, or pleading could save my grade; I had earned an F.
Seeing a failing grade on my transcript taught me two valuable lessons. First, I discovered that I needed the routine and accountability of an in-person class to ensure my participation in the material. Second, I was responsible for the grades I received. I probably could have come up with a million excuses for why I didn’t watch the lectures or do the assignments, but the reality was I just didn’t do it. I did not seek my professor’s help during their office hours when I started to fall behind, I did not go to the tutoring center on campus to get extra help, and I did not reach out to my classmates to form study groups. Although the F that I received will never disappear from my transcript, it is an important reminder of the gruesome conversation I had with my parents and the feeling of failure in the pit of my stomach. Needless to say, that was the only online course I took during my collegiate career, but it was absolutely worth the lessons learned. Professors do care about how you are doing in their class; they genuinely want you to succeed, but they will give you the grade you earn. There are people and resources on campus for you to utilize so you can earn the grade you want. Your professors are one of those resources, and are perhaps the most important. Go see them during office hours, ask them questions about the material and get extra help if you need it. The caveat here is that you cannot wait until the last week of the semester to visit your professors to get help. Tears and pleading will not help you at the eleventh hour. Another resource to utilize can be found in the campus learning center. I frequented my campus’ writing center for assistance with papers and research projects. Initially, I was scared to be critiqued, thinking my work would be perceived as inadequate. The first time I took a paper there, I recall standing outside the door for about ten minutes thinking of an excuse not to go in. Thankfully I saw a classmate walk in and I followed suit. The experience was less dramatic than I imagined it to be; no one ripped my paper to shreds and told me that I would never graduate. Instead I sat with an upper-class student who coached me through some pointers and suggestions for improvement. Thanks to that first visit, I received an A- on the paper! I thought I knew exactly what I wanted to do when I started college, but that changed three times by the time I graduated. Initially I started as an International Business major but ended up receiving a degree in Communication and continued on to graduate school. My greatest advice to you is to embrace feelings of uncertainty (if you have them) with regard to your academic, career, or life goals. Stop into the Career Services office on your campus to identify what it is that you really want to do when you graduate or to confirm your affinity to a career path. Make an appointment to see a counselor if you need to vent or get a new perspective. Do an internship in your field; this can give you a first-hand impression of what your life might look like in that role. When I chose International Business, I did not do so as an informed student. I enjoyed and excelled in my business courses in high school and I had hopes of traveling the world, so International Business seemed to fit the bill. Little did I know, the major required a lot of accounting and economics which, as it turned out, were not my forte. Thinking this is what I wanted, I wasted time pursuing a major I didn’t enjoy and academic courses I struggled through. So I took a different approach. I began speaking to the professionals around me that had jobs that appealed to me: Student Unions/Activities, Leadership, Orientation, Alumni, etc. I found out I could have a similar career, and I would enjoy the required studies along the way. Making that discovery provided direction and purpose in my major and extracurricular activities. I felt like everything was falling into place. I would like to pause for a moment and ask you to consider why you are in college? Why did you choose your institution? Have you declared a major yet? Why or why not? What are your plans post-graduation? By frequently reflecting in this way, you can assess whether or not your behaviors, affiliations, and activities align with your goals. 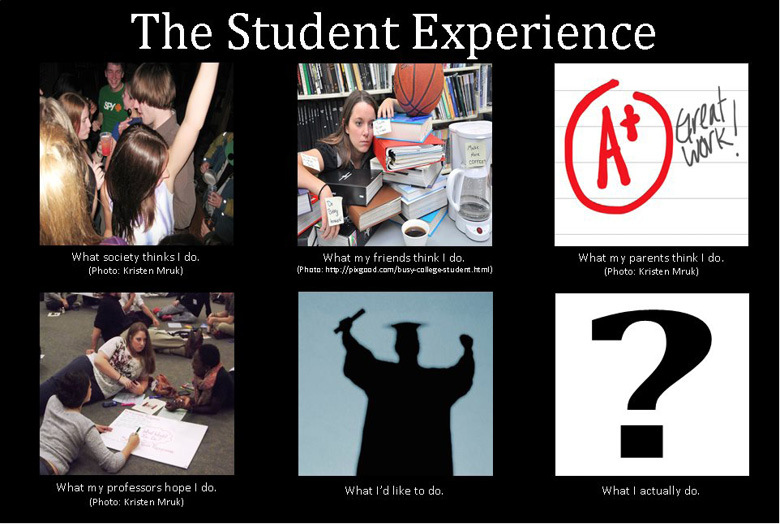 What you actually do with your student experience is completely up to you. You are the only person who can dictate your collegiate fate. Remind yourself of the reasons why you are in college and make sure your time is spent on achieving your goals. There are resources and people on your campus available to help you. You have the control—use it wisely. Foundations of Academic Success: Words of Wisdom. Edited by Thomas Priester. Essay authored by Kristen Mruk. Located at: https://milnepublishing.geneseo.edu/foundations-of-academic-success/chapter/the-student-experience/ License: CC BY: Attribution. Previous: Chapter 2: What’s College For? Blueprint for Success in College: Indispensable Study Skills and Time Management Strategies by Kristen Mruk is licensed under a Creative Commons Attribution 4.0 International License, except where otherwise noted.